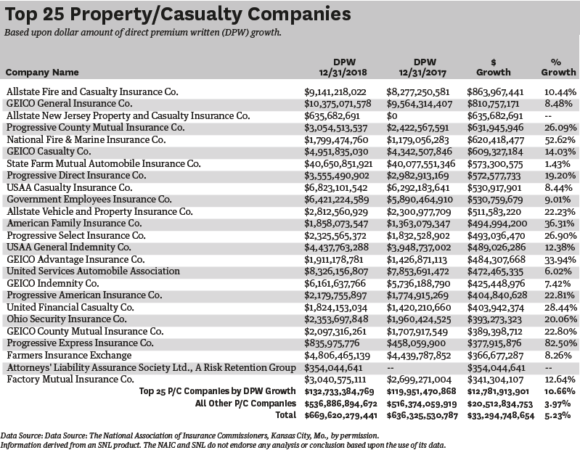 Direct premium written (DPW) for property/casualty insurance companies continues to increase, albeit gradually. At year-end 2018, nearly $670 billion of DPW was reported, a record high for the industry. For 2018, total DPW for all P/C insurers aggregately increased approximately 4 percent over 2017, an increase of $33.3 billion. More than 38% of this premium growth is attributed to the Top 25 P/C insurers in terms of growth. For the 12 months ending Dec. 31, 2018, P/C companies comprising the Top 25 insurers in terms of DPW growth increased their DPW approximately $12.8 billion, or 10.7% over 2017. This continues the Top 25 insurers’ impressive display of premium growth and financial stability. In contrast, the remainder of the industry reported an increase in DPW of $20.5 billion, or approximately 4% year-over-year. Although the market continues to exhibit signs of firming and DPW continues to increase, P/C insurers should not expect a traditional hard market in the near future. More importantly, it is possible that the double-digit premium growth experienced in the historical hard market cycles may have created unrealistic premium growth expectations for this current recovery. 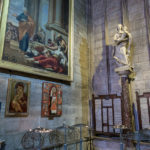 It is more realistic that expectations should relate to gradual, stable growth. If the industry continues to hold to its 10-year historical pattern, growth in 2019 would again result in the highest level of year-end DPW ever reported by the P/C industry.